And make a mess of the place. Once upon a time, in a world we know all too well, the Devil emerged from the pits of hell and began his apocalypse on the world. Much like any war, there were plenty of casualties on both sides. But humanity was losing. They were on their last leg, their final push to win the war.... when the Devil pulled his forces back and surrendered. To this day, his motives remain a mystery. Twenty-Five years later, demons and humans have learned to tolerate and even accept each other. Creatures such as vampires and werewolves revealed themselves as well. Civilization seemed to function just as it had before. In a time of peace, when all creatures were friends and forming meaningful relationships, more and more bodies are turning up at every crime scene. Demon, Vampire, and Human alike. Horrible crime scenes with a single message left for the gawkers. Your time here is over. As the immortal blame and threaten the humans, they in turn retaliate. Though nothing has been officially solved, these crimes threaten to throw the world into another war. Luckily, nothing has inspired outright violence yet, but things are not far off from that point. On Earth, no one seems to see reason. Except for our heroes. Together, a group of six "heroes" will fight against their differences to defeat this looming threat. Gain each other's trust and suffer through betrayals. An easily destructible force consisting of A Princess, a Guardian, a Best Friend, a Spy, a Ruler, and a Demon Hunter. Our only defense against a second Apocalypse. ~ FORUM RULES We know them, we respect them, and we love them. ~CHARACTERS One main character per person please! Otherwise, feel free to make characters besides the main Six! I don't mind how many characters you have just as long as you can handle it. ~ ACTIVITY I will be a lot more forgiving with this as I am extremely busy as well. Basically, come as often as you can but don't join and then disappear. If you are removed, simply ask to rejoin and I will add you back. ~ PLOT You are absolutely allowed to drive the plot somewhere as well. If you have an idea run with it! We'll play along as well. ~ HAVE THE UTMOST FUN, MY LITTLE DEVILS! There are many different types of demons. And while they can learn different powers, they are not proficient at anything but their born ability. Demons can be identified by their colorful snake-like eyes and black blood. The most common type of demon. They are masters of fire creation and manipulation and cannot survive in the intense cold. Demons that control lightning, rain, and winds. 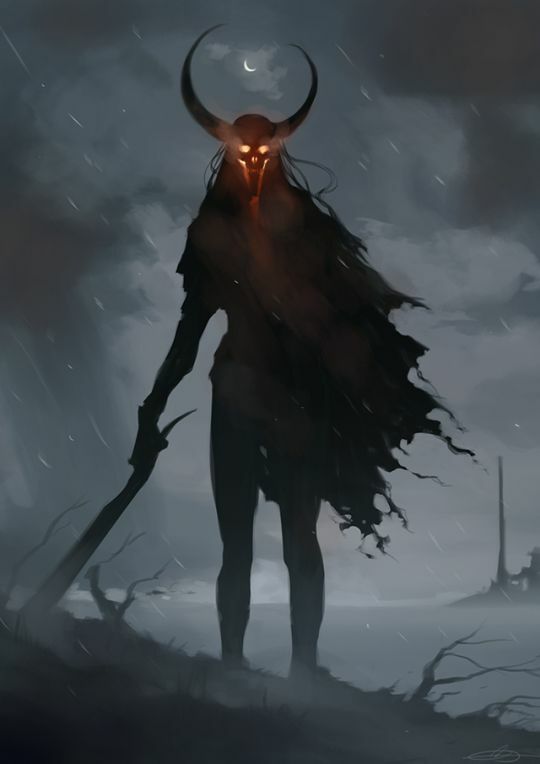 In their emotional state, these demons literally become a walking storm. Able to change their appearance and voice to whatever they please as well as "suggest" things that may tempt their victim into doing what they want. Demons that turn into hulking beasts that thrive on their own rage for a battle. They are the strongest and biggest of their kind. An extremely rare type of demon. They control darkness and turn into a mangled shadow with glowing eyes when not properly handling their emotions. Currently, there is only one in existence. More common than anyone would expect. They are demons that are born with no powers. Tend to stick to themselves during the day but at night they are the life of the party. Identified by their pale skin and hauntingly beautiful eyes. Unlike a lot of modern adaptions, these vampires walk in both the daylight and the moonlight. They have no need to sleep, afterall they are dead. However, vampires are more active during the Night hours. Carefully injecting their venom into a human's bloodstream turns that person into a nightwalker. One wrong move can kill the victim. Super speed, Super Senses, and Strength. Sadly, they don't fly or turn into animals/mist. There is not much known about them as they never really reveal themselves and look like any other person. From what is know is that most of the ones that reveal themselves are Guardian Angels for a specific person. Of course, they are used to fly. The wings are also retractable into the angel's back to help disguise as a human. Healing, Heightened Senses, Enhanced Strength, and Tough Skin (meaning that mortal weapons won't kill or seriously harm them but it will hurt). The creatures that violently transform into large canine beasts. These creatures are almost as elusive as Angels since not much is known about them either. Humans transform into wolfish creatures on the night of a full moon. The Transformation could happen at any moment as looking at the moon is not necessary for the process to begin. (Human form) Slightly enhanced senses and a bit of extra strength however not much. (Wolf form) Fully Enhanced strength, Speed, and Senses. The curse is inflicted through a bite. However, few survive the process of turning as it makes the victim violently sick as well as feeling from the bite marks. It is rumored that werewolves actually hunt in groups. But no one has been able to confirm it. A 5'4" 21-year-old mixed halfling (Fire Demon/Human) woman. She has long wavy black hair, full lips, and a thin frame. Her almond shaped eyes are an enticing blood red with the pupil being a slit instead of a human's round one. Raven is always wearing a necklace with one round ruby on a gold chain. She doesn't go anywhere without it. Raven is a friendly and sarcastic kind of person. She has a natural way of getting people to like her despite her heritage. She's not known to get angry very often as she's mostly patient. But, her fire burns more brightly with her rage. So don't make a fire demon angry. One of Lucifer's many grandchildren. The girl from hell. Fourth born of Seven to the Current Demon King and Queen. Third in line for the Throne. Ran away from home, despite all dangers to herself, to find out why her people are being slaughtered. An Angel who was tasked with protecting the princess as her Guardian Angel. One of their top priorities is for the Princess to stay alive. The other is to figure out what Earth is like. from where he was bitten on both his neck on on the side of his torso. Kai is usually a rather energetic creature- he isn't bubbly by any means, but he seems to be constantly in motion, whether it be twirling something in his fingertips or pacing back and forth. He can be sarcastic and is actually quite the pessimist- at one point of his life he was a fairly friendly guy, but after the death of his twin and him turning, he's become significantly less so. He's loyal to his best friend, though, and would honestly do anything for her. Best friends with Raven, other relationships are open. Picture- coming soon. I need to find one actually. The one that is best friends with The Princess. They are all for saving the world. Appearing very skinny and short, Pandora, a 20-year-old halfbreed (Shadow Demon/ Human), appears weak in regards to strength, and she is. Yet she makes up for this with her agility, speed, flexibility, and downright scary attitude when she’s on a mission or when’s she’s mad. She has naturally black hair with ombré scarlet streaks, and natural scarlet eyes, using her powers, she masks her eyes as green to appear human, or she wears green contacts. Pandora is a very secretive girl, hiding even her demon origins from her closest allies and friends. She is incredibly smart and reliable, but dead set on her goals. She is sarcastic, and often very outspoken about her opinions on things. What she lacks in actual physical strength, she makes up for in attitude. She is a good liar, doing the act easily to keep her goals hidden. Those goals include finding out about the crimes on Earth, and why her human mother was killed in one of the said crimes. And most the time, when she’s truly angered, or feeling a strong emotion, she tends to go off alone. Most of the time, she can control her emotions fairly well, making jokes from things to keep herself in line at times. She is a shadow demon, and has learned manipulation magic to keep herself hidden. To the demon community, the name Pandora is unknown, as if she was never born. To the human community, no birth certificates exist. She keeps her middle name unknown, as it’s the name she went by as a child(Alandria Delaney), and the name she was said to have as a demon, however Pandora is her real name. She uses her mothers human last name as her alias, as no one knew of her father’s and mother’s courtship(to her knowledge, that is). They are on a personal mission to figure out who is committing all these crimes on Earth. They work for The Demonhunter. Ronan is a 26-year-old 6'3" man with a strong, muscular body. His hair is a dark blonde, and is short on the sides and back, while being a little longer on the top. His eyes are a dark color, but it's hard to tell what color they are, since they almost seem to change each time one looks. He keeps a short, scruffy beard, and usually wears black clothing that is easy to move in. He also has an array of tattoos on his arms, waist, and back. Personality is just Serious. Moody. Judgmental. Closed off. Hates demons. Doesn't trust really anyone. Relationships unknown. Like literally nobody knows where he came from. Did he even have parents? A family? Because it seems like he was just spawned out of nothing. Did I mention he hates demons? A human who has made it their personal mission to get rid of demons. Interesting when they join team Demon huh? 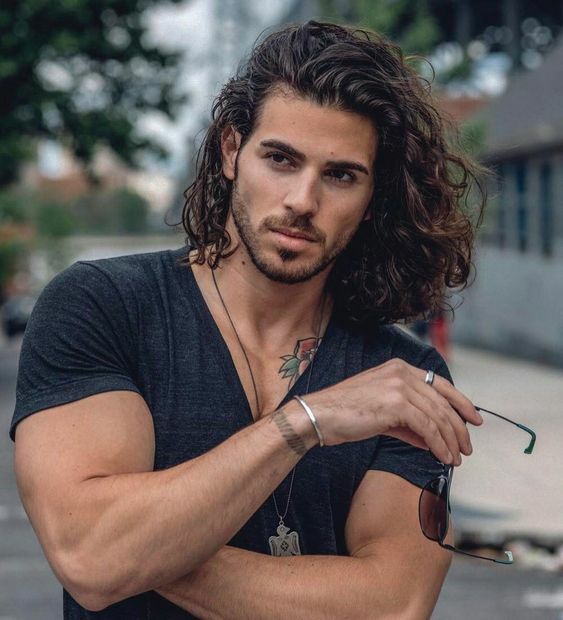 A General of the demon army as well as a Prince of Hell, Laz is a 23-year-old 6'2" muscular mixed halfling (Normal Demon/Human) man with long black hair and a bit of a beard. His snake-like eyes are red with the left one fading in color due to a battle injury leaving him partially blind. He has a scar covering most of the left side of his face and neck from the same injury. He's also covered in more little scars. Lazerous is a loud and playful man with an explosive temper. When not angry, Laz is everyone's big brother. Teasing people, joking with them, and taking care of them as well. However, when he's angry he is a force to be reckoned with. The oldest child of the Demon King and Queen. One of Lucifer's many grandchildren. Like most angels, the 19-year-old Persephone has a certain quality about her that sets her apart. Her pale skin is flawless, like porcelain, and she has soft blue eyes. 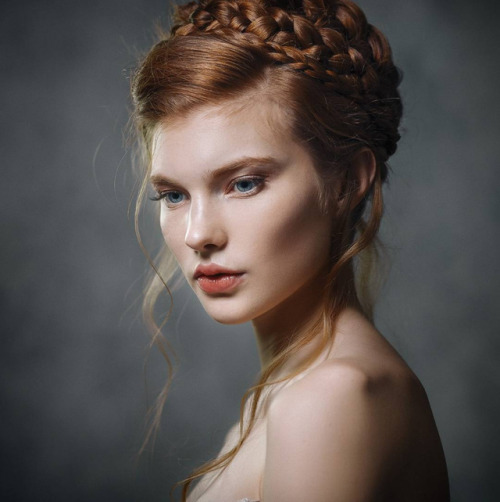 Her hair is a subdued strawberry blonde, and it reaches to about her hips when down, though she usually keeps it up in a braided updo. Her body is lean and graceful, without much curve to it, and she stands tall for a woman, at 5'10". Usually, she wears soft, neutral colors that don't draw much attention, but that compliment her pale complexion. Persephone is very dignified, serious, and proper. She has been told she doesn't know how to have fun, but in reality, she is just overly cautious and aware of her surroundings, and would never, ever do something to jeopardize herself, others, or her reputation. She is very straightforward, and sometimes sarcasm or jokes go over her head. It's 3 in the morning and i'm still typing DX but i think we're good besides the things I need to touch up. Personality ~ Felk appears outwardly cold and distant from others, and she prefers to let things seem as such. She is a bit calculating and willing to use others to get what she needs. However, she tends to have a soft spot for other vampires under her matriarchy and she has a hard time denying them requests for help or protection. Every century or so, she'll take a shining to a human and condition them for a few years before biting them and adding them to the fold. Description ~ Felk stands about 5'4" with pale skin and milk-blonde hair. She typically covers herself well to hide the marks and scars from countless fights and disasters over the eras, as to appear more untouchable. Felk hasn't really bothered to keep up with modern trends and still clothes herself in styles that look like they could have fallen out of an old rpg. 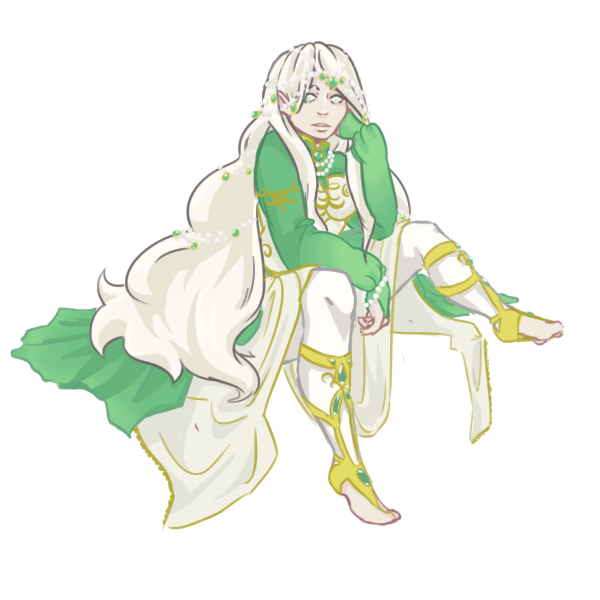 When traveling, she'll keep to her color palette of green, white, and gold, though she'll at least dress so that she isn't covered in baubles or other status tokens. Relationships ~ Felk has a few vampires she allows special attention to, though she doesn't typically travel with them. Otherwise, she doesn't usually connect with others outside of her circle. Raven had her hood up and her sunglasses on despite it being late at night. She moved quickly down the street, avoiding eye contact with anyone that passed her. Shoving her hands into the pockets of her jacket, she heaved a sigh and watched as steam curled from her lips momentarily warming the air. From what she could remember, the last murder had taken place in this city and around the corner just up ahead. Getting to the city had been the easy part, now It was just a matter of getting to the scene without being caught. It wouldn't be helpful if she was detained or killed too. A few more steps and she was turning down an alleyway. Ever increasingly closer to hopefully more answers. She felt her stomach flip at the thought of seeing the crime. But with another deep breath, she pushed the thoughts to the back of her mind and disappeared from the public eye. Felk had been in the city the day of the most recent attack. She had yet to hear who or what the victim had been, but the vampires in the city had been anxious enough about it that they'd requested of her to stay hidden for a few days. Some had gone as far as to offer her a place to stay, but she'd declined all of them and just kept herself out of sight for the most part. But now it was time for her to start moving again. She just didn't like sitting idle, and if she couldn't stay safely in the city, she was going to keep walking until she found somewhere she didn't have to look over her shoulder as often. She'd opted to move at night, just because she had more energy then. She didn't care much for traveling with other vampires since it was hard enough to keep herself fed without drawing attention. As she grew closer to the general area where she knew the attack had happened, she turned curious. Perhaps there would be something she could pull from the scene the human police couldn't. A scent, a trail, anything that was beyond human senses. As far as she was concerned, it couldn't hurt to just take a look. Personality ~ Valentina is shy and anti-social, but working on becoming more confident. She puts on a brave face when she needs to but she crumbles under pressure. When she's not trying to hold this brave facade, she's indecisive and looks to others to make decisions for her. She also rarely initiates conversations, and mostly only speaks when spoken to. Description ~ Valentina stands at 5'5" with a lithe frame, narrow shoulders and wider hips. Her skin is pale but slightly olive-tinted, with sparse freckles across her face, shoulders, and arms. Her wavy hair is auburn and falls several inches shy of her knees, so long that she has to braid or tie it back most days. The corner where the body had been found was a dark dead end taped off with Police tape. No light reached the alleyway to illuminate the scene before the halfling. The most she could make out was that there was sent of dried blood on the walls, and the body had been moved. Probably taken to a morgue for an autopsy. Raven looked over her shoulder towards the way she had come and searched for someone who might be nearby. Once she was convinced that she was alone, Raven snapped her fingers and a fire sparked to life in her hands. The Princess sucked in a sharp breath at the sight of the crime. Blood. Too much of it. And of course, the words that had been circling around the news. Your time here is over was written on the wall in what looked like spray paint. Taking a few minutes to study the scene she finally registered what she was seeing. Red blood not Black. So it wasn't a demon that was murdered. While that was a good sign one of her own hadn't fallen victim again, someone had been killed. And she had to find out who. Felk wasn't sure about exactly what alley the body had been found in, so it took her a bit of trial and error to actually find an alleyway that smelled like blood that was only a few days old. But it looked like she wasn't the only one here. There was someone else here, with a light burning in their hand. She narrowed her eyes against it, waiting a moment before she spoke. "Am I to assume someone's returning to the scene of the crime?" She hissed, ready to dart away if they tried to toss that flame her way. Raven whipped around and backed up from the voice. Her eyes were wide as her heart jumped to her throat. She couldn't see the owner of the voice that well. Just a vague shape in the distance. But they sounded hostile. Narrowing her eyes, Raven stood up straighter. "And am I to say the same to you, stranger?" she asked. She increased the brightness of the flame in her hand to see a little better. A female shape it looked like. "I only want to know what happened here. I'll leave as soon as I'm done." "Funny, you'd think if we'd both been involved we'd recognize each other. Find anything interesting?" Felk replied, crossing her arms. Whoever this kid was, she didn't seem to fit the bill for murder. Felk began to advance, looking past the woman to the stains on the pavement behind her. Blood, obviously. She could smell that, and considering who she was, it wasn't enough to phase her. She couldn't tell by scent what kind of creature the blood had come from, it was too old and dried for that. But the thought of a fellow vampire letting this much of a potential meal go to waste sounded unlikely. What did the other crime scenes look like? Were they all this messy? Considering most of the deaths had been a good mix of all creatures and humans, she wasn't sure she could properly rule out anything. Was it upsetting to think one of hers could cut down one of their own? Or that any creature could attack one of its own kind. Yes. But as unlikely as it felt, it could be possible. Raven watched the other woman carefully. She wasn't sure whether she should trust this stranger with answers or not. But it wasn't like she had much to share. "Not really," she answered simply before turning and following her gaze. "Without a body, we can't identify the victim. So we don't know what species they were. The only thing I can confirm is that it's not demon. We don't have red blood," she explained, crouching to look for anything else the police might have left behind. Jewelry, an ID card, something small and missable. But nothing came up. She then looked to the other woman. "Your eyes...." she trailed off as she got a better look at the new person. "I've never met a vampire before." Felk turned her head a bit toward the woman when she said 'we' in her statement about demons blood. "As far as demons go, I haven't really messed with them much in the last few centuries. Mostly, you know, kept to my own circles and just tried to keep the kids out of chaos." She watched the demon-woman crouched down by the blood stains. "You came out here without anyone watching your back? Considering you met me out here, you could have run into worse, but still. Not the brightest move I've seen." "I could say the same about you," Raven started a smile forming on her lips. She stood and looked over the scene once more while sitting back in her hip. "But I knew the risks. I'm assuming you did too." She teased lightly before crushing the flame in her hand, putting it out. With the warmth of her fire gone, the cold rushed to her skin and sent a shiver through her. Raven bundled herself tighter into her jacket and glanced at the vampire. "There isn't much to here. Unless I missed something, I think I'm going to go find that body." "Vampires are safer if they're not in groups. It's just how things go." Felk shrugged. Again, the demon caught her attention with her next words. "You're going to find the body? You wouldn't know what morgue they took it to, would you?" In all honesty, she considered just going on her own to investigate. But this woman clearly knew more about demons than she did. If there was any sign a demon was involved, this young woman would probably find it before she did. "The might not let just any demon or any vampire in to see the body. Especially if they want to blame us for the death." Felk turned quiet for a moment, thinking. She began walking alongside the other woman. "Hey, so I'm not going to assume that demons are great liars, but how good are you at following a lie?" Raven raised her eyebrow at the Vampire. Considering how she had never met a vampire, she assumed they stuck to their own kind in some sort of big warehouse somewhere. But, the information was good to know. As the other woman asked her questions, Raven thought them over. She, in fact, didn't know what morgue the body was in. Her best guess was the closest one to the crime scene or police department. And again she had a good point. If they were to get access to the body they might need to be sneaky about it. "Demons don't normally lie. I, however, am good at it. What did you have in mind?"